Air Movers, typically called air horns or blowers, are used wherever there is a need to disperse fumes, move air into confined spaces, cool men working in elevated temperature conditions, or cool machinery or products with a blast of directed air. Common applications are found in refineries, chemical plants, power and congeneration units, metal fabrication plants, paper and pulp plants, shipyards, the marine industry and the steel industry. 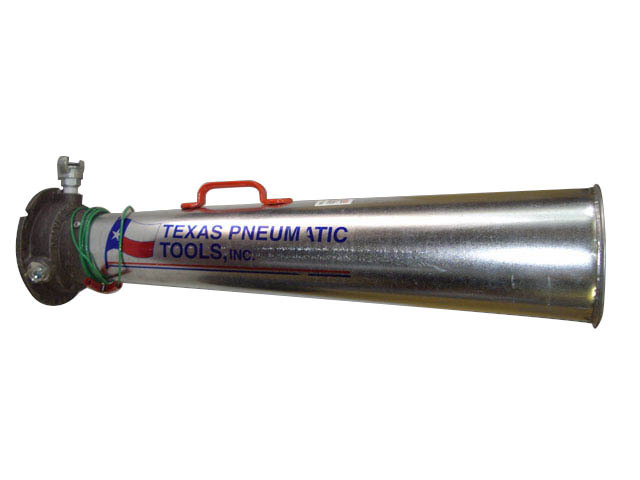 Texas Pneumatic Air Movers have been tested at an independent laboratory. The published air flow ratings are based on AMCA (Air Movement & Control Association)Standard 210 tests. Under identical testing situations, Texas Pneumatic Air Movers exceeded all air flow ratings of competitively manufactured air movers. We have three types of Air Movers available, and we are the only manufacturer to offer all sizes of Air Movers in all three horn materials (Galvanized sheet metal, Stainless steel and Polymer).